The Zumwalt 12 in action at Bath Iron Works on June 18, 2016 -- Connie Jenkins is seated, wearing a red shirt and floppy hat. Let me say first that I’m grateful for the chance to briefly explain to you why I decided to risk arrest on June 18th of last year. On the face of it, the case against me is very simple. As the officer testified, I stood and then sat down in the street until I was arrested, I would imagine a time of about 10 minutes. I did what I’m charged with. At the same time, I believe the charge against me is irrelevant because I acted for the greater good according to moral necessity, according to my conscience. I understand that moral necessity may not be a legal defense. However, I have sworn to tell “nothing but the truth”; and in truth it is moral necessity that has brought me here. I am a Christian peacemaker, a parishioner at St. Paul the Apostle parish in Bangor, and a member of Pax Christi Maine, a Catholic peace and social justice movement guided by the spirituality of nonviolence. As such, I am called to live my life according to the precepts given by Jesus in the Beatitudes and the Sermon on the Mount. I have taken a solemn vow of nonviolence through Pace e Bene, an international peace organization, and as part of that vow, I am committed to helping the struggle to abolish War. Jesus declared, Blessed are the peacemakers for they shall be called the children of God. And what that means to me is that if I consider myself to be a Christian, I have to do my part to make a more peaceful world. I must speak out against War, and take public action for peace. As a follower of the nonviolent Jesus, I found it impossible to remain silent as another weapon of mass destruction was blessed and prepared for delivery to the Navy. And so, I joined eleven other men and women who also chose to risk arrest for the cause of Peace. 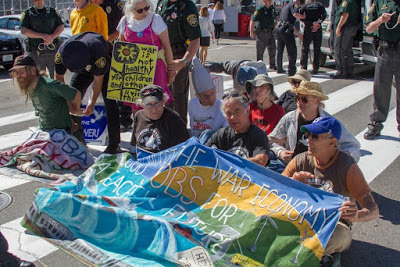 Through the simple act of sitting down and refusing to move, we embodied a resounding “No” to the immeasurable suffering caused by national policies that have made weapons of mass destruction and unrestrained, endless war our country’s major exports. On January 1st, Pope Francis celebrated the 50th World Day of Peace. In his address, titled “Nonviolence: A Style of Politics for Peace”, he urged all of us to “make active nonviolence our way of life” and to reject what he calls the “horrifying world war fought piecemeal” in which we find ourselves engaged. I think about the young men and women in their crisp white uniforms who walked past us that June day on their way to boarding the Destroyer. And I hope that in seeing us sitting on the ground, waiting to be arrested, a seed was planted which may cause them to deeply reflect on what they have been trained to do and to turn away from the deception and evil and horror of War. 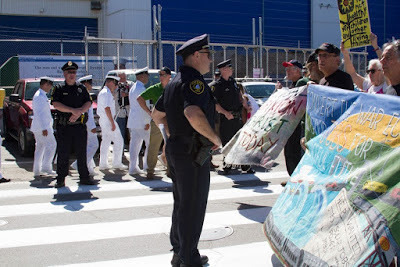 "The Zumwalt destroyer crew members had to pass by our protest. We are trying to prepare them for what they will see when they port in Korea, Guam, Philippines, Okinawa, Australia, Japan, Ukraine......the world is fed up with U.S. militarism and 'exceptionalism'." From the blog of Zumwalt 12 member Bruce Gagnon. Thank you to all the peacemakers who sacrifice their freedom for the sake of us all! I am grateful and inspired! Proud to call you friends!